Canada is a nation with vast wilderness – soaring mountains, calm fresh waters, raging rivers, sweeping forests and abundant wildlife. We live in a country rich in natural resources – the basis for our strong economy. No matter where you live – be it in the city or the country – you can experience nature in your own backyard and community. The Canadian Wildlife Federation believes in conserving Canada’s wildlife and encourages the wise use of our natural resources. We believe in living sustainably for future generations. Canadians should be able to enjoy the outdoors for all it has to offer through gardening, hiking, fishing, canoeing, camping, biking, birdwatching, swimming, wildlife photography and so much more. CWF has spent the last 50 years working diligently to foster this Canadian way of life. We deliver programs that encourage people to experience the great outdoors, discover the wonders of nature and learn about the trials it faces. We also challenge government and industry to improve legislation and practices for wildlife and habitat. We conduct and sponsor scientific research to help better understand how we may help wildlife. 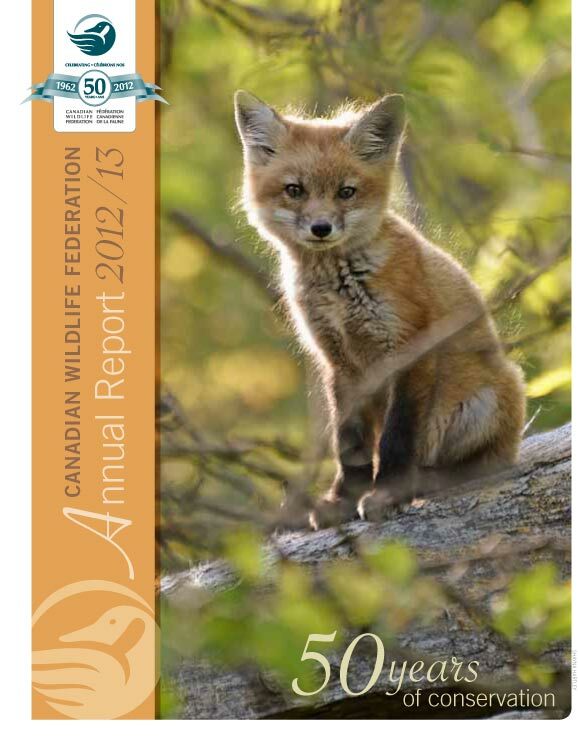 This report is a snapshot of CWF’s accomplishments over the past year. We have made great progress. Thanks to the support of our donors we have increased your investment in vital conservation and education programs to $11M. We also broadened our efforts to get people outdoors and into nature. In 2012, CWF advanced conservation by investing in speciesat- risk research and creating a land use tool to assess the development and wildlife trade-offs in the environmentally sensitive western boreal forest. Over 80% of our supporters feel more connected to Canada’s wildlife thanks to CWF! We truly believe people can make a difference for wildlife. People, like you and I. Whether you’re a policy maker, a stay-at-home parent, a construction worker or a young Canadian, we all, every one of us, can make a difference to Canada’s creatures great and small. We would like to thank our supporters, volunteers and corporate and organizational partners for their help. Without their participation, we could not have achieved all that we did in 2012. We’ve celebrated a 50-year history rich in achievements and look forward to working with you towards a future where the people of Canada live in harmony with wildlife – a truly Canadian lifestyle. I look forward to seeing this future unfold with you.